27% of U.S. adults lie to their dentist about how often they floss their teeth, with 15% saying they’d rather wash dirty dishes than floss. Studies show smiles can make us more attractive, lower our stress levels, elevate our moods, and make us look younger. And, periodontal disease can drastically affect the way your smile looks. Periodontal disease, more commonly known as gum disease, is the most widespread chronic inflammatory condition worldwide. In the U.S., one out of every two adults age 30 and older have some form of periodontal disease; in fact, gum disease is 2.5 times more common than diabetes. The good news is periodontal disease is treatable and sometimes even reversible with good oral hygiene habits and professional treatment from a periodontist. 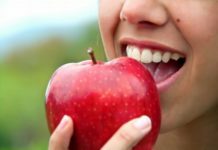 Because taking care of your gums shouldn’t be an afterthought, the American Academy of Periodontology (AAP) launched the “Love The Gums You’re With” campaign to educate people about gum disease and how to prevent it. Treating your gums with the love and care they deserve leads to a spectacular smile! 1. Know the cause. Poor oral hygiene is the number one culprit in the development of gum disease. There are more than 500 different species of bacteria that can be found in dental plaque. When you do not stick to proper oral hygiene habits, such as twice-daily brushing and regular flossing, the plaque can build up below the gum line and cause irritation that can lead to gingivitis, a mild form of gum disease. Untreated gingivitis can lead to a more advanced form of gum disease called periodontitis. 2. Know your risk factors. Biological makeup, age, hormones, and lifestyle choices like smoking, medications, diseases, poor nutrition, and stress can affect your risk for developing periodontal disease. Knowing your risk for periodontal disease and discussing it with your dental professional is a vital step in preventing periodontal disease. 3. Take action. Establishing and maintaining good oral hygiene habits are crucial in preventing gum disease. Brushing twice a day and after meals helps reduce food trapped between teeth and gums that can lead to irritation. Flossing daily is the most effective way to remove food particles and plaque between the teeth and gums that brushing cannot reach. 4. Understand treatment options. Gum disease has a range of treatment options based on the state of the disease. Non-surgical treatments include scaling and root planing, which clean the surface of the roots of teeth to remove plaque, tartar, and bacteria. Advanced periodontal disease may require surgical treatments like periodontal pocket reductions and regenerative procedures. If left untreated, a number of health issues can arise, such as tooth decay, tooth loss, and other serious oral health problems. 5. See a periodontist. There are dental experts out there who can help treat gum disease—periodontists. Periodontists are dentists who specialize in the prevention, diagnosis, and treatment of periodontal disease, and they receive three additional years of training after dental school. With that skillset, periodontists can help you keep your gums healthy to be able to chew and smile forever. 6. Know where to go. To learn more about your oral health, check out Gumblr.org, a new website developed by the AAP to find local periodontists, learn more about gum disease, take interactive quizzes, and much more. 1. Disregard the impact of periodontal disease. While gum disease causes a lot of trouble for the teeth and mouth, research suggests it is also associated with other serious inflammatory diseases like cardiovascular disease and diabetes. Periodontal pockets in the gums allow bacteria to enter the bloodstream which can wreak havoc on the immune system. 2. Ignore the warning signs and symptoms. The absence of pain in the early to moderate stages of gum disease can lead to a lack of urgency and awareness. It is crucial to visit your dental professional for regular check-ups and a periodontist annually for a comprehensive periodontal evaluation, so periodontal disease can be diagnosed before symptoms arise. Gum health may not be at the forefront of everyone’s mind, but it should be. A 2015 survey from the AAP showed 27% of U.S. adults lie to their dentist about how often they floss their teeth, with 15% saying they’d rather wash dirty dishes than floss. Brushing twice a day and flossing regularly is the key to a healthy smile and a healthy body. And remember, the gums you have are yours for life, so Love The Gums You’re With.